Also known as twenty-one, online Blackjack is the world’s most popular casino banking game at the land based casinos as well as online. It’s a card comparison game between the player and the dealer. Other people are welcome to play at the same table against the dealer. It’s a pretty simple game to learn and is recommended for beginners. 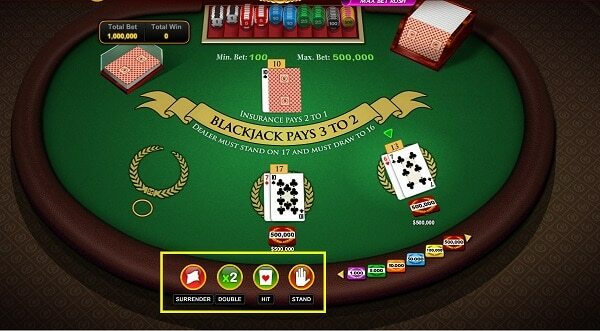 As you’ll discover in this guide on how to play Blackjack which takes just a short amount of time to learn. With some practice and a little bit of strategy, you can master the game and meet the objective of beating the dealer. It might surprise you to learn that there is quite a bit of shoddy gambling advice floating around most casinos. Perhaps the worst is the misconception that the goal of Blackjack is to get as close as you can to a score of 21, without going over. Wrong! The goal of blackjack is to beat the dealer. This involves not going bust (i.e. getting a score higher than 21) and either outscoring the dealer or having the dealer go bust. The house edge is probably the lowest the casinos have to offer with usually only 0.5% or less. This percentage from the house edge means that the casino predicts to win over the long run, after thousands of bets have been made. That means, depending on the house edge, you usually have a 44% to 45% chance of winning for each hand you play. This can be great as long as you follow the basic strategies and stop when you’re ahead. You can play Blackjack with one to eight decks of 52 cards a piece. Aces may be counted as 1 point or 11 points. Cards 2 through 9 are counted according to their pip value, and 10s and all face cards are worth 10 points apiece. A hand’s value is the sum of all point values on individual cards. “Blackjack” is the highest possible hand. It consists of an ace and any 10-point card, and it outranks all other hands that sum up to 21 points. Players bet before hands are dealt. Each player receives two cards, and so does the dealer. The dealer’s cards are dealt with one facing up and the other, known as the “hole card,” facing down. In the event the dealer has an ace showing, players will be offered a side wager known as “insurance.” The side bet pays 2 to 1 if the dealer’s hole card is a 10-point card that results in Blackjack for the dealer. Insurance bets are optional, and can be any amount up to half the original wager. If the dealer has an ace or a 10 showing (after offering insurance in the event the ace is face up) he will peek at his hole card to see if he has Blackjack. If so, he will turn the card over immediately. If the dealer has a Blackjack, then the house wins and all wagers (with the exception of insurance) will be lost. 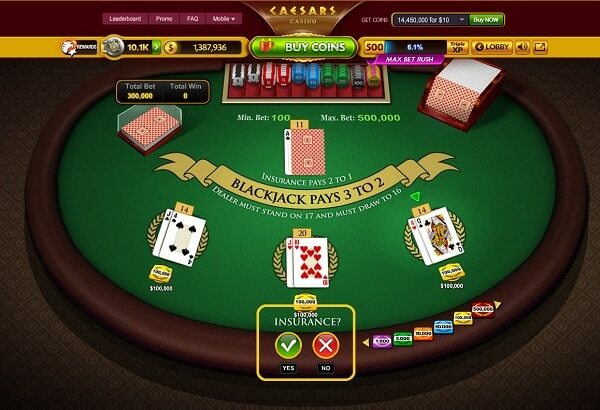 In the event one or more players also has Blackjack, the result is called a “push.” The dealer will return bets to anyone with a push, and will also resolve insurance wagers. Stand: The player keeps (stands pat with) his cards. Hit: The player receives another card, or more if desired. If the card causes that player’s points to exceed 21, he or she loses. Double: The player receives one more card, and only one, after doubling his or her bet. Split: In the event that the player has a pair or any two 10-point cards, then the cards may be separated into two individual hands, the player’s bet may be doubled, and the dealer will give an additional card to each of the hands. The player may then opt to stand, hit, or double. If splitting aces, each ace is given just one card. 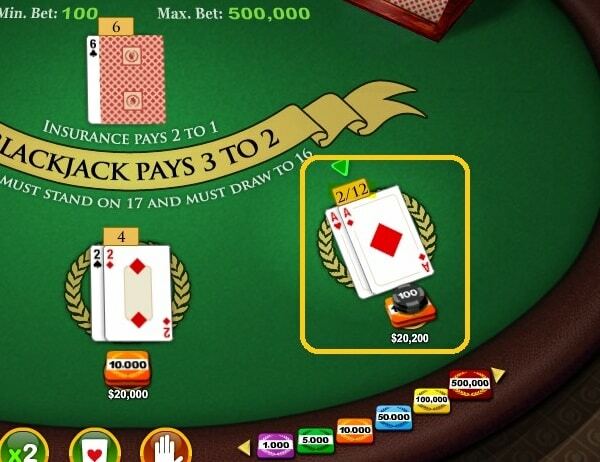 In some establishments, players are not allowed to double after splitting, or re-split aces. Finally, if the player gets an ace and a ten after splitting, it counts as 21 points instead of Blackjack. In most cases, a player can re-split up to four hands. Surrender: The player opts to forfeit half his bet, keeps the other half, and does not continue to play out his hand. The surrender option is only available on the first two cards, and some establishments do not allow this option at all. Once all players have had their turns, the dealer will reveal his or her hole card. If the dealer has a score of 16 or less, then another card will be drawn. If the dealer has an ace and cards that total six points (a score also known as a “soft 17”) house rules may dictate that the dealers stands or deals another card. If the dealer’s score exceeds 21 points, any player who didn’t already bust will win his or her bet. If the dealer does not bust, then either he or the player with the highest point total will win. Winning wagers almost always pay even money, except in cases where a winning player has Blackjack. If this happens, then most establishments pay 3 to 2. Some casinos short-pay Blackjacks. Knowing the rules before beginning game play will ensure no unpleasant surprises later. 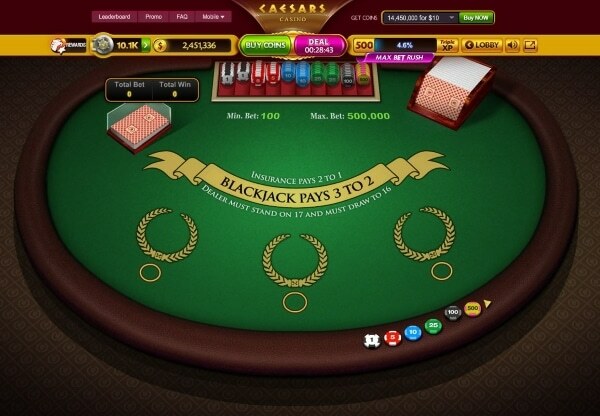 One of the best ways to sharpen your skills before hitting the casino floor is to spend time familiarizing yourself with Blackjack by playing online in a social casino setting. Caesars Casino lets you learn having fun without risking real money. Not only are these games free to play, but they’re also available 24/7. You also don’t have to make any travel arrangements to visit it a casino, but instead you can simply pick up your electronic device and play from your home, or wherever you’d like. We invite you now to come on in and place your bet!